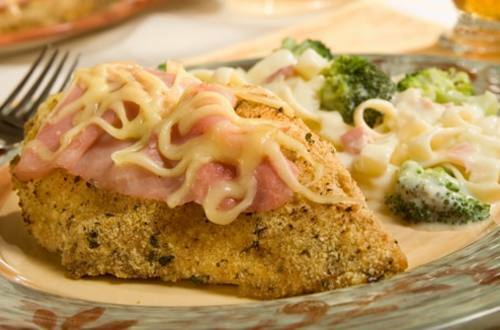 Italian seasoned bread crumbs give this classic crunchy chicken cordon bleu recipe its perfectly browned crust, while the combination topping of ham and cheese adds just the right amount of salty flavor. 1 Preheat oven to 400°. Line baking sheet with aluminum foil, then spray with no-stick cooking spray; set aside. 2 Brush chicken with Hellmann's® or Best Foods® Real Mayonnaise, then coat in bread crumbs. Arrange chicken on prepared baking sheet. Bake 15 minutes. Evenly top chicken with 4 slices ham and cheese. Bake an additional 5 minutes or until chicken is thoroughly cooked. 3 Meanwhile, prepare Knorr® Italian Sides™ - Alfredo according to package directions, adding broccoli and remaining 2 slices ham, cut into 1/2-inch pieces, during last 3 minutes. Let stand about 2 minutes or until sauce is thickened. Serve with chicken.